While it may be a hackneyed and abused concept, there’s no way to stop Silicon Valley from overusing the term “disruption.” Instead, I’ll jump on the bandwagon myself, because understanding industry disruption can and should be a useful exercise in corporate or startup planning. 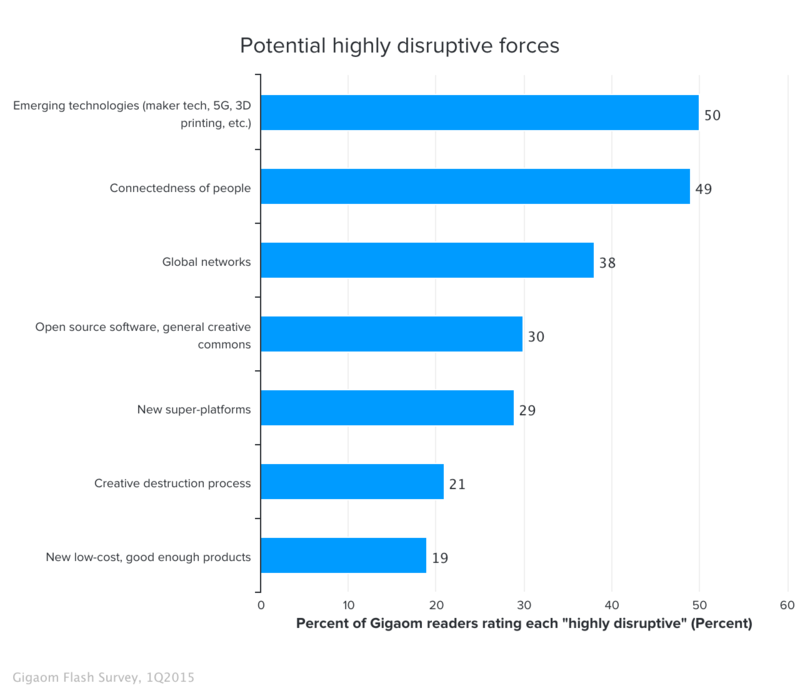 We’re applying some Gigaom Research resources to mapping out the dynamics of industry disruption to create a framework for our readers and clients for identifying and characterizing disruptive forces so that they can drive them for their own success, or defend against being overwhelmed by them. The chart below illustrates the results of our Flash Survey. We asked respondents to rate on a five-point scale from “not at all disruptive” to “highly disruptive” a collection of factors as potential industry or economic forces. Most respondents rated new technologies and the connectedness of people as the most highly disruptive, and essentially demoted the tried-and-true Christensen model of lower-cost substitute technology. I’ll let Clayton Christensen defend himself. No doubt “platform” itself is another overused concept, but the new ingredient for the proven recipe of APIs, cloud-based services, ecosystems, and network effects is market adjacency — the idea that a platform with its roots in one market sector can migrate to another. This is particularly powerful when there is a collection of companies that can be either re-organized or stimulated by the arrival of the new platform. Think of how Apple is taking iOS into payments and smart homes, and how Microsoft and Sony are trying to re-arrange the television business via game consoles, or how Uber is attempting to extend its virtual taxi service into delivery or on-demand moving. Most companies should not try to create a new platform, even though that’s a popular pitch in far too many red herrings. Most can’t supply the right combination — or volume – of technology and tools, customer prospects and revenue streams, or distribution and syndication. But making the right bets on platform winners in order to play a key role in the resulting marketplace or ecosystem will be critical as mainstream industries re-build themselves as digital services. We’re working on the next part of our disruption analysis that will lay out a canvas that companies can use for internal planning. Senior execs at startups and enterprises alike can use this canvas to assess the near-term features and pace of disruptions, and identify and communicate strategies to their organizations and potential partners. Besides assessing its own corporate capabilities and readiness to react or drive disruption, management may well have to adjust existing decision-making and measurement processes. Then it’s a matter of understanding the information layer surrounding the emerging environment, and crafting a narrative to rally the troops and position the company publicly. Clay’s right about the tone from his Harvard colleague in that New Yorker article. Like a jury argument at the Salem Witch trials. Fear and rage against the unindicted “acolytes and imitators, including no small number of hucksters” would, I suppose include as suspects most thinking people, especially my fellow inventors. 60 Minutes did a hit piece on Vinod Khosla, his foremost disciple (The Innovator’s Ecosystem), and now Prof. Christensen is in the old media pillory for championing technology development.